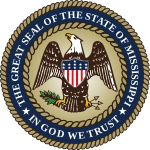 The 2012 United States Senate election in Mississippi was held on November 6, 2012, alongside the 2012 U.S. presidential election, other elections to the United States Senate in other states, as well as elections to the United States House of Representatives and various state and local elections. Incumbent Republican U.S. Senator Roger Wicker won re-election to his first full term, while Albert N. Gore (no relation to former Vice President Albert Arnold Gore) was the Democratic nominee. This would've been Trent Lott's fifth term as Senator had he remained in office. Former U.S. representative Roger Wicker was appointed by Governor Haley Barbour after then-incumbent Trent Lott retired at the end of 2007. A 2008 special election was later scheduled to determine who would serve the remainder of the term. Then-U.S. Sen. Roger Wicker defeated former Mississippi Governor Ronnie Musgrove with 54.96% of the vote in the special election and will be up for re-election in 2012. ^ Dr. Michael McDonald (February 9, 2013). "2012 General Election Turnout Rates". George Mason University. Archived from the original on April 24, 2013. Retrieved April 3, 2013. ^ a b c Amy, Jeff (January 13, 2012). "Fields fill up for Mississippi congressional races". Sun Herald. Associated Press. Archived from the original on January 17, 2012. Retrieved January 16, 2012. ^ a b Farrell, David A. (February 10, 2012). "Saturday noon is last chance to register to vote in March 13 primaries". Picayune Item. Retrieved February 19, 2012. ^ "2012 Republican Primary Results". Secretary of State of Mississippi. March 23, 2012. Archived from the original on February 23, 2013. Retrieved March 29, 2012. ^ Corder, Frank (January 4, 2012). "And They're Off!". Y'all Politics. Retrieved January 16, 2012. ^ Killebrew, Matt (January 10, 2012). "Weiner will make senatorial run". Clarksdale Press Register. Retrieved January 16, 2012. ^ "2012 Democratic Primary Results". Secretary of State of Mississippi. March 23, 2012. Archived from the original on May 1, 2012. Retrieved March 29, 2012. ^ Farrell, David A. (January 7, 2012). "Congressional candidates campaign here, cite reasons for running". Picayune Item. Retrieved January 16, 2012. ^ "912 Project Hattiesburg hosts forum for conservative candidates". WDAM-TV. January 19, 2012. Retrieved February 19, 2012. ^ "Wicker triumphs in MS GOP US Senate primary". WLOX. March 13, 2012. Retrieved March 14, 2012. League of Women Voters on Albert N. Gore Jr.